As a long-time observer of Punjab, and especially as someone who witnessed the turbulent 1980s first hand, India’s north-western gateway cannot be in a better shape. With militancy reduced to a paper tiger, communal amity all around and stable successive governments, Punjab has a lot going for it, relatively speaking. Yet, the Punjab of today is still a seething cauldron. Its long-term structural malaise has come to afflict the economy, society and polity alike. Corruption, voluntary unemployment and drugs/substance abuse are tearing apart the fabric of the state. Given the high base of development that this state inherited, its problems are also unique and slightly different from national average. The doyen of Akali politics, chief minister Parkash Singh Badal is no longer perceived to be in control of his government, with the reins being firmly in the hands of his son, deputy CM Sukhbir Singh Badal, and his controversial brother-in-law Minister Bikramjit Singh Majithia. The Punjab BJP is in a state of inertia triggered by a central leadership that listens to the Akalis more than their own state leaders. The Congress is yet to recover from its shock defeat in the 2012 assembly polls, and even though the showing has been average in Lok Sabha polls, it is nevertheless fancying its chances in 2017 polls. Under these circumstances the Aam Aadmi Party that won four Lok Sabha seats in last year’s general elections is emerging as the proverbial dark horse in the state’s polity. Although the assembly polls in the state are likely to take place in January 2017 the political structures of the future are beginning to crystallise in Punjab right now. In order to gauge the prevailing winds of change, Cvoter conducted a snap poll across the state with a randomly selected sample of 1047 respondents. Here is what we discovered. When asked to pinpoint the problems affecting them most deeply, the respondents chose a troika of issues. Corruption was the leading issue chosen by 23.6% respondents, with alcoholism/drug abuse a close second at 22.8%, followed by unemployment at 17.3%. While corruption as a concern, along with frustration at ill-governance, is largely in consonance with the national mood, the latter two issues are deeply intertwined and unique to Punjab. A higher per capital income base and an overall robust agriculture sector have made the Punjabi youth aspire for a higher standard of living. Owing to progressive de-industrialisation and emigration of businesses, worthwhile job opportunities are shrinking in the state. However, due to the NRI economy and well-oiled state support for agriculture a lot of young people have ended up with cash in hand but no work to do. This has resulted in a state-wide underground drug trade aided from the other side of Wagah. This is eating away at the famed youth of Punjab, and is a scourge that has anguished civil society in recent years. With a sharp focus on drug abuse, the Aam Aadmi Party’s campaign capitalised on the spectre haunting the “granary of India” and won four Lok Sabha seats in the 2014 general elections. These wins were achieved on the basis of a leadership that was sourced from Manpreet Badal’s Punjab People’s Party and ex-Left leaders who until then had been a house divided in Punjab. Therefore it was no surprise when 89% of the respondents averred that AAP’s victory in the Delhi election would affect the Punjab polls. However, only 45% thought that AAP was ‘very well’ consolidating its hold in their area while another 40% felt the party was only ‘somewhat’ doing so. A full 61% backed AAP’s decision to not contest the ongoing Punjab Municipal polls. Another 88% believed that AAP would benefit from infighting within the SAD-BJP alliance. 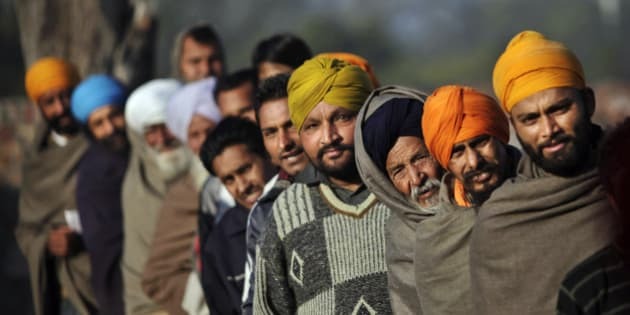 Further to that, 80% respondents in the poll believed that the absence of high-profile leaders such as Manish Sisodia and Arvind Kejriwal in Punjab would not hinder AAP’s poll prospects in the state. Also, commenting on the Dera factor 39% respondents believed that Dera Sacha Sauda’s leaning towards the BJP could impact polls; 55% thought otherwise. Moving away from the party question. The scenario becomes interesting when we analyse the responses to questions on chief ministers past and present. When asked to name the best chief minister in the past 20 years, 40% vouched for Amritsar MP Captain Amarinder Singh. In second position was Beant Singh, named by 20.3% of the respondents, followed by current CM Parkash Singh Badal with 19% of the vote. Ironically, two of these leaders are from the Congress even though the party has been in power for only seven out of the past 20 years. Despite the high approval ratings for his past term (2002-2007) Captain Amarinder Singh has some cause for concern currently. When asked to name the best candidate for the post of chief minister of Punjab, 27% respondents favoured Captain Amarinder Singh and 26% preferred Bhagwant Mann, an AAP MP. Only 14% wanted to see Navjot Sidhu of the BJP in power, while current deputy CM Sukhbir Badal got a mere 2% approval rating. Hence we can conclude that as of now, at least in terms of leadership stakes, the major battle is between the AAP and Congress. The BJP is losing ground and the SAD seems to have fallen by the wayside. Our next focus of exploration was perception of win. When the respondents were asked to name the winner of the next elections irrespective of their loyalties, 56% of the respondents thought that the AAP would walk away with the winner’s title in 2017. A mere 9% believed that the Congress would win 2017, 8% backed the BJP as frontrunner while only 5% thought SAD had a fighting chance. Clearly, in terms of voter perception at least, AAP enjoys a runaway lead in Punjab. Punjab was one of the earliest states to dislodge a Congress state government and it could repeat the trend by being the first major state where AAP could score a victory and outflank the twin poles of current Punjab polity.